Divergent phialides and long, tangled chains of elliptical conidia borne from more complex fruiting structures characteristic of Purpureocillium lilacinum; magnification 460X. Purpureocillium is a fungal genus in the Ophiocordycipitaceae family. The genus now contains 12 species with a representative species Purpureocillium lilacinum, a common saprobic, filamentous fungus. It has been isolated from a wide range of habitats, including cultivated and uncultivated soils, forests, grassland, deserts, estuarine sediments and sewage sludge, and insects. It has also been found in nematode eggs, and occasionally from females of root-knot and cyst nematodes. In addition, it has frequently been detected in the rhizosphere of many crops. The species can grow at a wide range of temperatures – from 8 to 38 °C (46 to 100 °F) for a few isolates, with optimal growth in the range 26 to 30 °C (79 to 86 °F). It also has a wide pH tolerance and can grow on a variety of substrates. P. lilacinum has shown promising results for use as a biocontrol agent to control the growth of destructive root-knot nematodes. The species was originally described by American mycologist Charles Thom in 1910, under than name Penicillium lilacinum. Taxonomic synonyms include Penicillium amethystinum Wehmer and Spicaria rubidopurpurea Aoki. In 1974, Robert A. Samson transferred the species to Paecilomyces. Publications in the 2000s (decade) indicated that the genus Paecilomyces was not monophyletic, and that close relatives were Paecilomyces nostocoides, Isaria takamizusanensis and Nomuraea atypicola. The new genus Purpureocillium was created to hold the taxon. The generic name refers to the purple conidia produced by the fungus. Purpureocillium lilacinum used to be classified with the Fungi Imperfecti or Deuteromycetes, fungi for which perfect (i.e., sexually reproducing) states have rarely been found. Paecilomyces lilacinum was classified in the section Isarioidea, for which perfect states have not been found. Many isolates of P. lilacinum have been identified from around the world and it is accepted that variation exists within the species. Phylogenetic analysis of P. lilacinum isolates show that it is more closely related to Trichoderma, Gliocladium and Hypocrea than to the other entomopathogenic Paecilomyces species in the Hypocreales. Purpureocillium lilacinum forms a dense mycelium which gives rise to conidiophores. These bear phialides from the ends of which spores are formed in long chains. Spores germinate when suitable moisture and nutrients are available. Colonies on malt agar grow rather fast, attaining a diameter of 5–7 cm within 14 days at 25 °C (77 °F), consisting of a basal felt with a floccose overgrowth of aerial mycelium; at first white, but when sporulating changing to various shades of vinaceous. The reverse side is sometimes uncolored but usually in vinaceous shades. The vegetative hyphae are smooth-walled, hyaline, and 2.5–4.0 µm wide. Conidiophores arising from submerged hyphae, 400–600 µm in length, or arising from aerial hyphae and half as long. Phialides consisting of a swollen basal part, tapering into a thin distinct neck. Conidia are in divergent chains, ellipsoid to fusiform in shape, and smooth walled to slightly roughened. Chlamydospores are absent. Purpureocillium lilacinum is highly adaptable in its life strategy: depending on the availability of nutrients in the surrounding microenvironments it may be entomopathogenic, mycoparasitic, saprophytic, as well as nematophagous. Purpureocillium lilacinum is an infrequent cause of human disease. Most reported cases involve patients with compromised immune systems, indwelling foreign devices, or intraocular lens implants. Research of the last decade suggests it may be an emerging pathogen of both immunocompromised as well as immunocompetent adults. 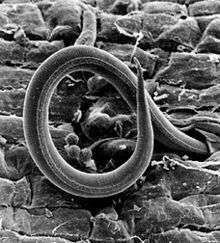 P. lilacinum is used as a biocontrol agent for several nematode species, such as Meloidogyne incognita, shown here. Plant-parasitic nematodes cause significant economic losses to a wide variety of crops. Chemical control is a widely used option for plant-parasitic nematode management. However, chemical nematicides are now being reappraised in respect of environmental hazard, high costs, limited availability in many developing countries or their diminished effectiveness following repeated applications. Purpureocillium lilacinum was first observed in association with nematode eggs in 1966 and the fungus was subsequently found parasitising the eggs of Meloidogyne incognita in Peru. It has now been isolated from many cyst and root-knot nematodes and from soil in many locations. Several successful field trials using P. lilacinum against pest nematodes were conducted in Peru. The Peruvian isolate was then sent to nematologists in 46 countries for testing, as part of the International Meloidogyne project, resulting in many more field trials on a range of crops in many soil types and climates. Field trials, glasshouse trials and in vitro testing of P. lilacinum continues and more isolates have been collected from soil, nematodes and occasionally from insects. Isolates vary in their pathogenicity to plant-parasitic nematodes. 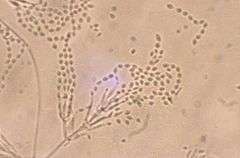 Some isolates are aggressive parasites while other, though morphologically indistinguishable, are less or non-pathogenic. Sometimes isolates that looked promising in vitro or in glasshouse trials have failed to provide control in the field. Many enzymes produced by P. lilacinum have been studied. A basic serine protease with biological activity against Meloidogyne hapla eggs has been identified. One strain of P. lilacinum has been shown to produce proteases and a chitinase, enzymes that could weaken a nematode egg shell so as to enable a narrow infection peg to push through. Before infecting a nematode egg, P. lilacinum flattens against the egg surface and becomes closely appressed to it. P. lilacinum produces simple appressoria anywhere on the nematode egg shell either after a few hyphae grow along the egg surface, or after a network of hyphae form on the egg. The presence of appressoria appears to indicate that the egg is, or is about to be, infected. In either case, the appressorium appears the same, as a simple swelling at the end of a hypha, closely appressed to the eggshell. Adhesion between the appressorium and nematode egg surface must be strong enough to withstand the opposing force produced by the extending tip of a penetration hypha. When the hypha has penetrated the egg, it rapidly destroys the juvenile within, before growing out of the now empty egg shell to produce conidiophores and to grow towards adjacent eggs. Paecilotoxin is a mycotoxin isolated from the fungus. Its significance is unknown. Khan et al. (2003) tested one strain of P. lilacinum for the production of paecilotoxin and were unable to show toxin production in that strain, suggesting that toxin synthesis may vary among isolates. 1 2 "Paecilomyces lilacinus (Thom) Samson 1974". MycoBank. International Mycological Association. Retrieved 2011-07-17. ↑ Domsch KH, Gams W, Anderson TH, eds. (2007). Compendium of Soil Fungi (2nd ed.). Lubrecht & Cramer Ltd. p. 322. ISBN 978-3-9803083-8-0. 1 2 3 Samson RA. (1974). "Paecilomyces and some allied hyphomycetes". Studies in Mycology. Baarn: Centralbureau voor Schimmelcultures. 6: 58. ↑ Anderson TH, Domsch KH, Gams W (1995). Compendium of Soil Fungi. Lubrecht & Cramer Ltd. ISBN 3-9803083-8-3. 1 2 Inglis PW, Tigano MS (2006). "Identification and taxonomy of some entomopathogenic Paecilomyces spp. (Ascomycota) isolates using rDNA-ITS Sequences" (PDF). Genetics and Molecular Biology. 29 (1): 132–6. doi:10.1590/s1415-47572006000100025. ↑ Sung GH, Hywel-Jones NL, Sung JM, Luangsa-ard JJ, Shrestha B, Spatafora JW (2007). "Phylogenetic classification of Cordyceps and the clavicipitaceous fungi". Studies in Mycology. 57 (1): 5–59. doi:10.3114/sim.2007.57.01. PMC 2104736 . PMID 18490993. ↑ Luangsa-Ard J, Houbraken J, van Doorn T, Hong SB, Borman AM, Hywel-Jones NL, Samson RA (2011). "Purpureocillium, a new genus for the medically important Paecilomyces lilacinus". FEMS Microbiology Letters. 321 (2): 141–9. doi:10.1111/j.1574-6968.2011.02322.x. PMID 21631575. ↑ Rombach MC, Aguda RM, Shepard BM, Roberts DW (1986). "Infection of rice brown planthopper, Nilaparvata lugens (Homoptera: Delphacidae), by field application of entomopathogenic hyphomycetes (Deuteromycotina)". Environmental Entomology. 15 (5): 1070–3. ISSN 0046-225X. ↑ Marti GA, Lastra CC, Pelizza SA, García JJ (2006). "Isolation of Paecilomyces lilacinus (Thom) Samson (Ascomycota: Hypocreales) from the Chagas disease vector, Triatoma infestans Klug (Hemiptera: Reduviidae) in an endemic area in Argentina". Mycopathologia. 162 (5): 369–72. doi:10.1007/s11046-006-0072-3. PMID 17123036. ↑ Fiedler Ż, Sosnowska D (2007). "Nematophagous fungus Paecilomyces lilacinus (Thom) Samson is also a biological agent for control of greenhouse insects and mite pests". BioControl. 52 (4): 547–8. doi:10.1007/s10526-006-9052-2. ↑ Gupta SC, Leathers TD, Wicklow DT (1993). "Hydrolytic enzymes secreted by Paecilomyces lilacinus cultured on sclerotia of Aspergillus flavus" (PDF). Applied Microbiology and Biotechnology. 39 (1): 99–103. doi:10.1007/bf00166856. hdl:10113/25102. ↑ Tigrano-Milani MS, Carneiro RG, de Faria MR, Frazão HS, McCoy CW (1995). "Isozyme characterization and pathogenicity of Paecilomyces fumosoroseus and P. lilacinus to Diabrotica speciosa (Coleoptera: Chrysomelidae) and Meloidogyne javanica (Nematoda: Tylenchidae)". Biological Control. 5 (3): 378–82. doi:10.1006/bcon.1995.1044. ↑ Saberhagen C, Klotz SA, Bartholomew W, Drews D, Dixon A (1997). "Infection due to Paecilomyces lilacinus: a challenging clinical identification". Clinical and Infectious Diseases. 25 (6): 1411–3. doi:10.1086/516136. PMID 9431388. ↑ Westenfeld F, Alston WK, Winn WC (1996). "Complicated soft tissue infection with prepatellar bursitis caused by Paecilomyces lilacinus in an immunocompetent host: case report and review". Journal of Clinical Microbiology. 34 (6): 1559–62. PMC 229063 . PMID 8735119. ↑ O'Day DM (1977). "Fungal endophthalmitis caused by Paecilomyces lilacinus after intraocular lens implantation". American Journal of Ophthalmology. 83 (1): 130–1. PMID 299984. ↑ Pettit TH, Olson RJ, Foos RY, Martin WJ (1980). "Fungal endophthalmitis following intraocular lens implantation. A surgical epidemic". Archives of Ophthalmology. 98 (6): 1025–39. doi:10.1001/archopht.1980.01020031015002. PMID 7190003. ↑ Safdar A. (2002). "Progressive cutaneous hyalohyphomycosis due to Paecilomyces lilacinus: rapid response to treatment with caspofungin and itraconazole". Clinical and Infectious Diseases. 34 (10): 1415–7. doi:10.1086/340260. PMID 11981740. ↑ Lysek H. (1996). "Study of biology of geohelminths. II. The importance of some soil microorganisms for the viability of geohelminth eggs in the soil". Acta Universitatis Palackianae Olomucensis. 40: 83–90. 1 2 Jatala P, Kaltenbach R, Bocangel M (1979). "Biological control of Meloidogyne incognita acrita and Globodera pallida on potatoes". Journal of Nematology. 11: 303. ↑ Stirling, GR (1991). Biological Control of Plant Parasitic Nematodes. UK: CABI Publishing. p. 282. ↑ Stirling GR, West LM (1991). "Fungal parasites of root-knot nematode eggs from tropical and sub-tropical regions of Australia". Australasian Plant Pathology. 20 (4): 149–54. doi:10.1071/APP9910149. ↑ Jatala P. (1986). "Biological control of plant-parasitic nematodes". Annual Review of Phytopathology. 24: 453–89. doi:10.1146/annurev.py.24.090186.002321. ↑ Gomes Carniero RMD, Cayrol J (1991). "Relationship between inoculum density of the nematophagous fungus Paecilomyces lilacinus and control of Meloidogyne arenaria on tomato". Revue Nématologique. 14 (4): 629–34. ↑ Bonants PJM; Fitters PFL; Thijs H; den Belder E; Waalwijk C; Henfling JWDM. (1995). "A basic serine protease from Paecilomyces lilacinus with biological activity against Meloidogyne hapla eggs". Microbiology. 141 (Pt 4): 775–84. doi:10.1099/13500872-141-4-775. PMID 7773385. ↑ Khan A, Williams KL, Nevalainen HK (2004). "Effects of Paecilomyces lilacinus protease and chitinase on the eggshell structures and hatching of Meloidogyne javanica juveniles". Biological Control. 31 (3): 346–52. doi:10.1016/j.biocontrol.2004.07.011. ↑ Money NP. (1998). "Mechanics of invasive fungal growth and the significance of turgor in plant infection". Molecular genetics of host-specific toxins in plant disease. Netherlands: Kluwer Academic Publishers. pp. 261–71. ↑ Mikami Y, Yazawa K, Fukushima K, Arai T, Udagawa S, Samson RA (December 1989). "Paecilotoxin production in clinical or terrestrial isolates of Paecilomyces lilacinus strains". Mycopathologia. 108 (3): 195–9. doi:10.1007/BF00436225. PMID 2615806. ↑ Khan A, Williams K, Nevalainen H (2003). "Testing the nematophagous bioloigcal control strain Paecilomyces lilacinus 251 for paecilotoxin production" (PDF). FEMS Microbiology Letters. 227 (1): 107–11. doi:10.1016/S0378-1097(03)00654-2. ↑ Park JO, Hargreaves JR, McConville EJ, Stirling GR, Ghisalberti EL (2004). "Production of leucinostatins and nematicidal activity of Australian isolates of Paecilomyces lilacinus (Thom) Samson" (PDF). Letters in Applied Microbiology. 38: 271–6. doi:10.1111/j.1472-765X.2004.01488.x. PMID 15214724.